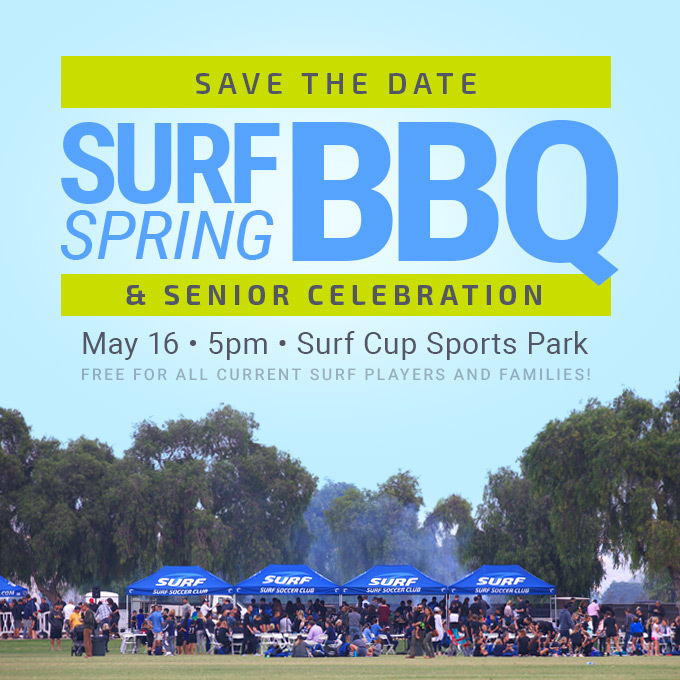 Please join us Thursday, May 16, immediately following practice at the Surf Cup Sports Park for the Surf Soccer Club’s Spring BBQ! This is our chance to say thank you to those that have been at the club and to welcome our new players to our Surf family. Also, we will be celebrating Surf’s graduating Seniors at our BBQ before our Girls U19 DA team plays Albion at 5:30pm. Join us for food, drinks and stay to cheer on our Surf DA girls. There will be a jump house for the kids and a beer/wine garden for the adults. Sign up for text alerts when the fields are closed. Sign up on RainedOut.com – search Surf Soccer Club or simply text SDSURF to 84483.